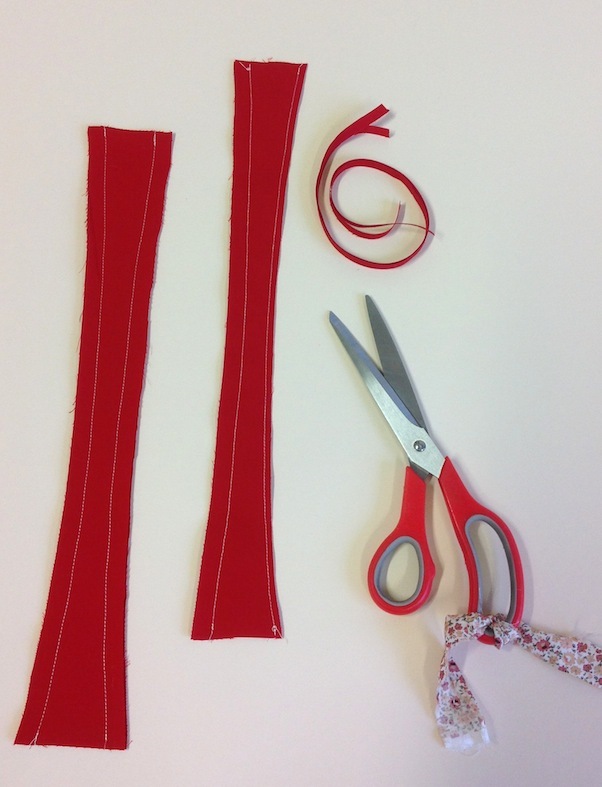 *For those of you making up the wide collar strap variation 1, we will be showing you how to create and baste the straps in the next post; for now, simply skip the skinny strap part. 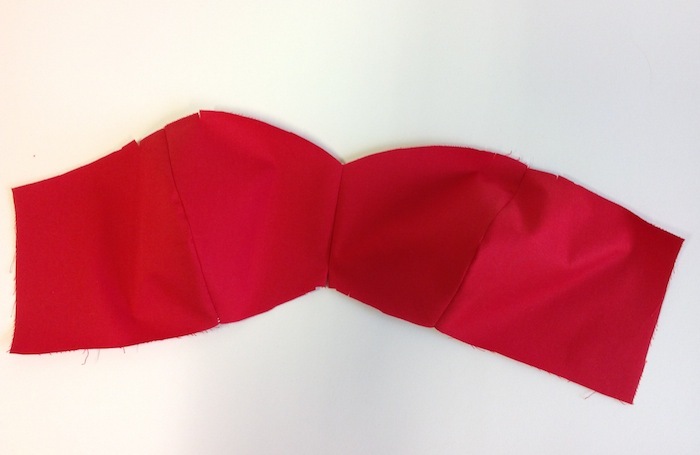 **For those of you making up the bonus strapless variation, we will be boning next week (ooh, did I say that out loud?! ); for now, just assemble the bodice shell and lining but do not join them together. 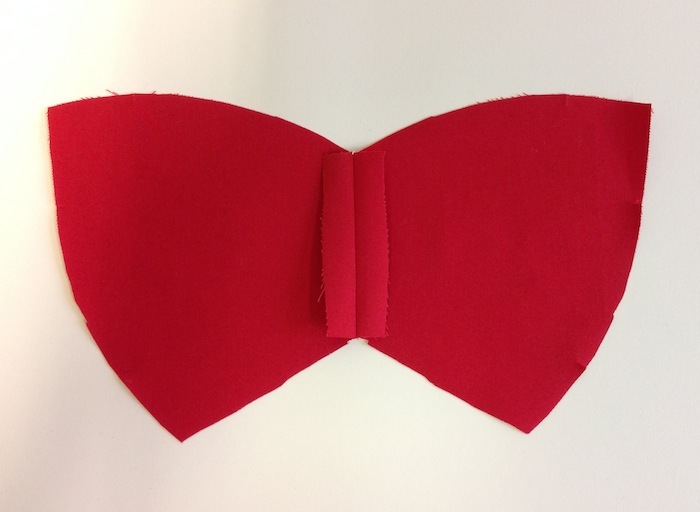 Begin by taking your two bodice centre front pieces. 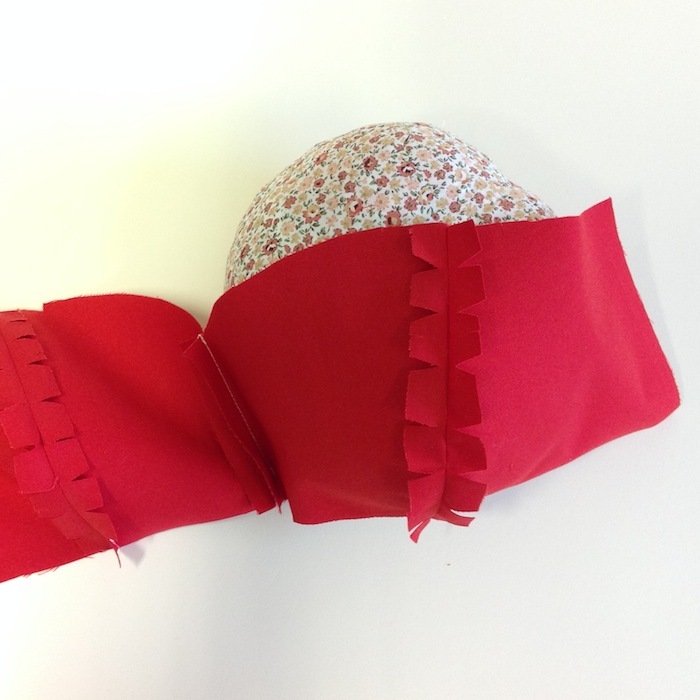 Place them with right sides together and stitch the central seam with the usual 5/8" or 15mm seam allowance. Start your stitching from the top (remembering to backstitch at the start and finish of your line of stitching! ), but end 5/8" or 15mm from the bottom. This will make joining the skirt much easier later on. Finish the excess and press the seam open. 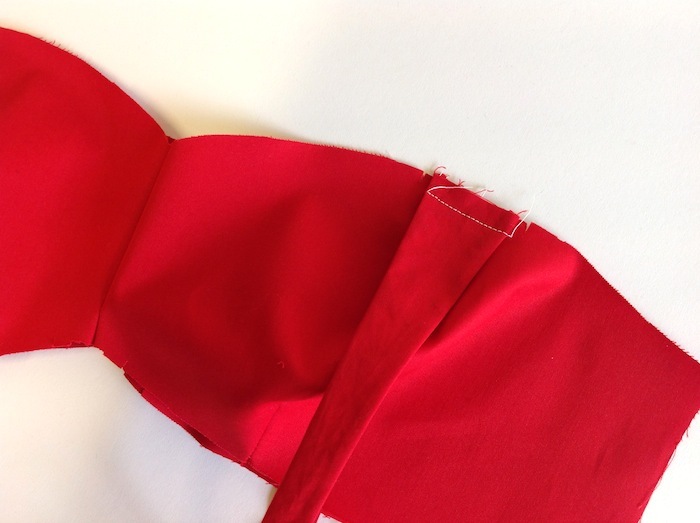 Please note, we don't have an overlocker/serger in the studio at the moment, so we have shown our seams pressed open and not "finished". For a comprehensive tutorial on seam finishes, please see this post. 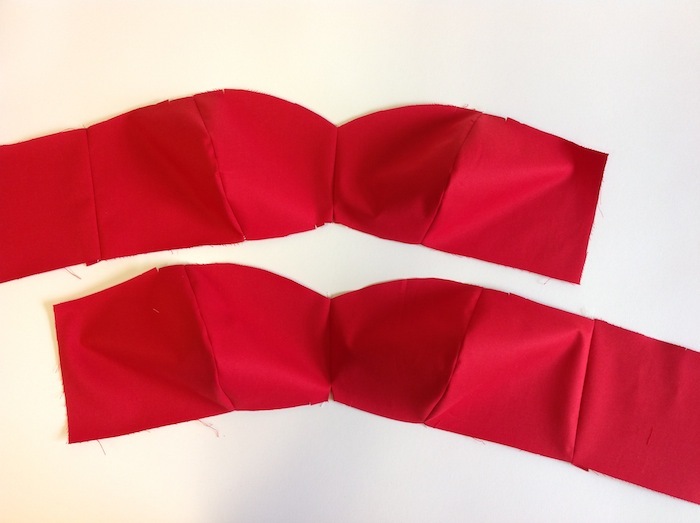 To make pressing this curve even easier, use a tailors ham (we love Kristiann from Victory Patterns' tutorial on Tilly & the Buttons blog). 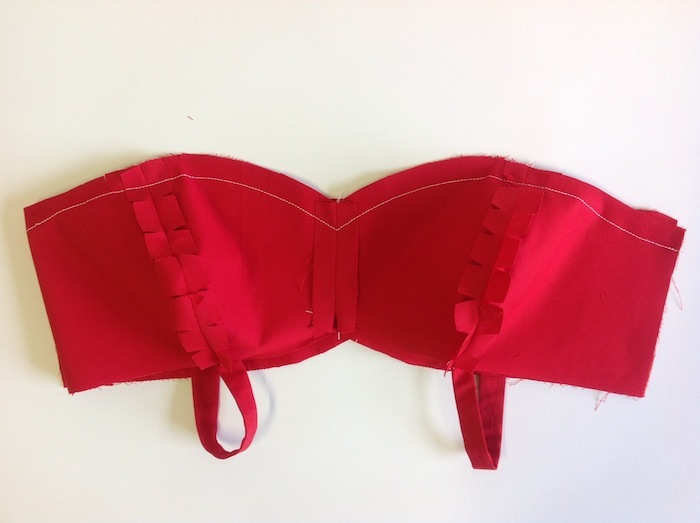 Now take your bodice back piece and pin to the righthand side seam, right sides together. Stitch into place and press open. Repeat this entire process for the bodice lining pieces, remembering to stitch the bodice back to the lefthand side seam instead. 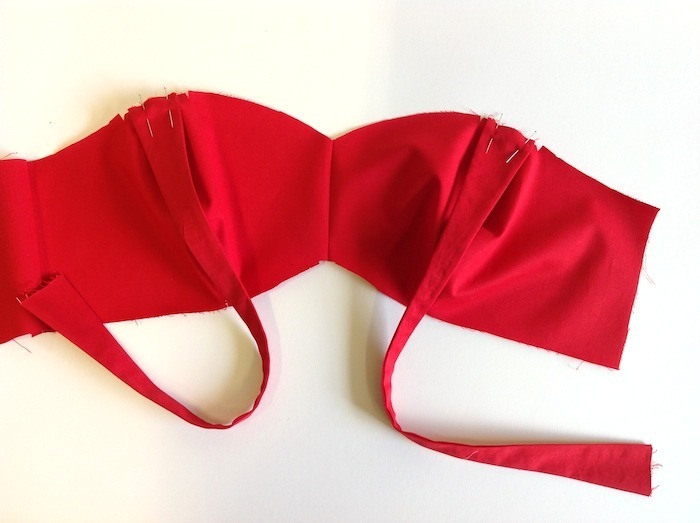 Take a pair of skinny strap pieces and pin, right sides together. 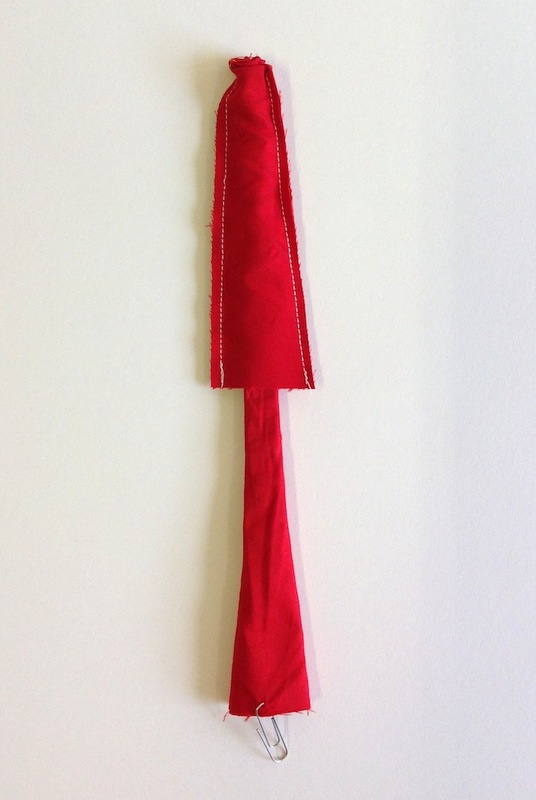 Stitch down each length, this time with just 1/2" or 12mm seam allowance. Trim away the excess - but not too close to the seam! 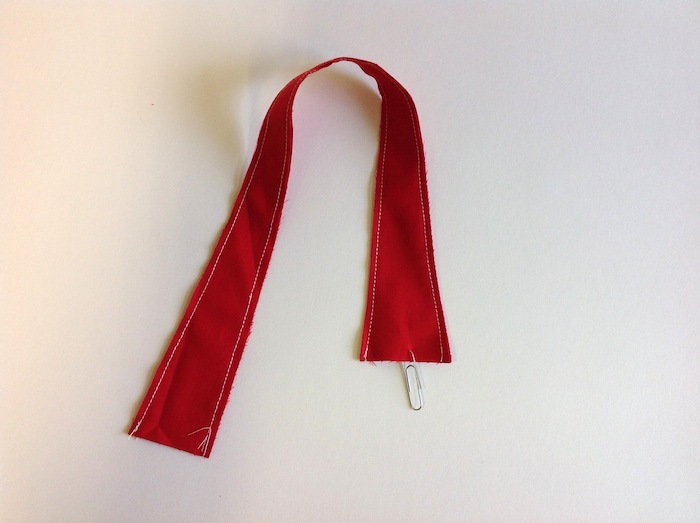 Use a safety pin or a paper clip to help you to turn the straps out to the right side. Give the straps a good press. 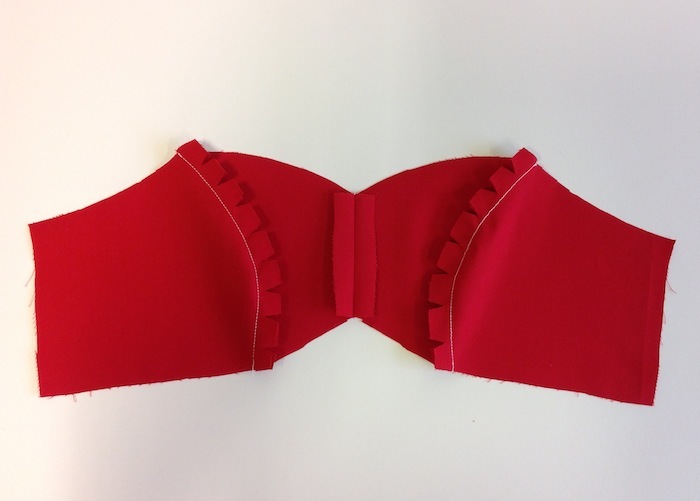 Now take your bodice shell and pin one end of each strap centralised between the notches either side of the bust seams. Make sure that your straps are pointing down, and not up and out, or you won't be able to join your lining. Baste into place with a line of machine stitches about 1/4" or 6mm from the raw edge. 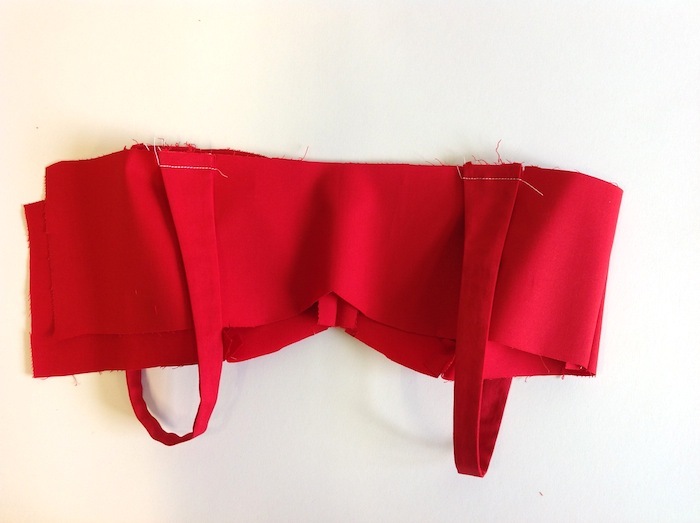 Bring the loose ends of the straps under and up to the bodice back piece and baste into place between the notches. 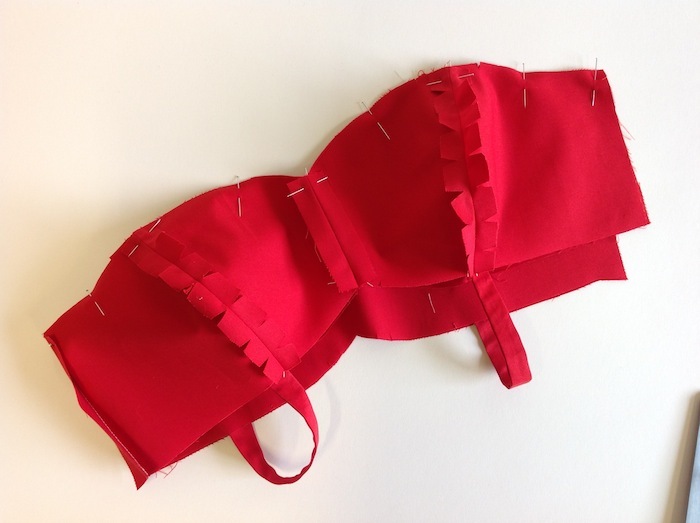 Take your bodice lining, and with right sides together, pin all long the neckline, matching seams and notches. 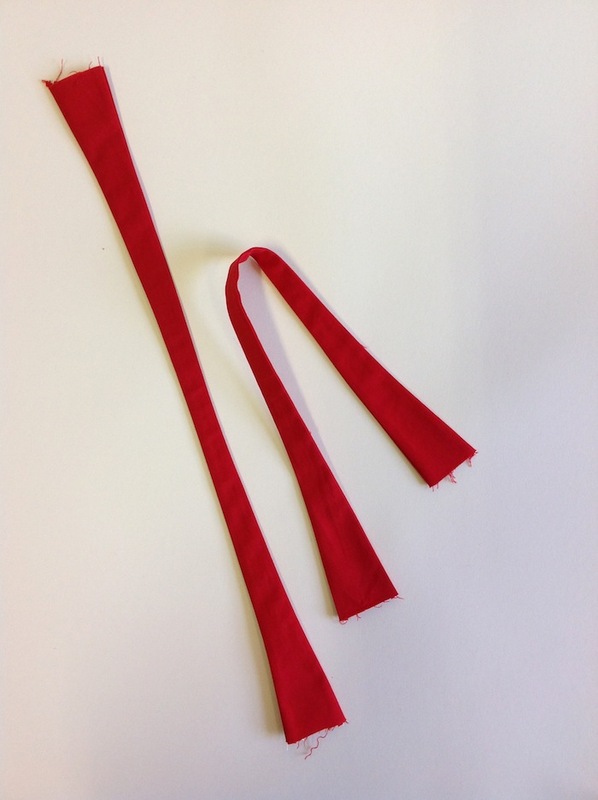 If making the skinny strap variation 2, keep your straps facing down and out of the way (as shown in the image below). 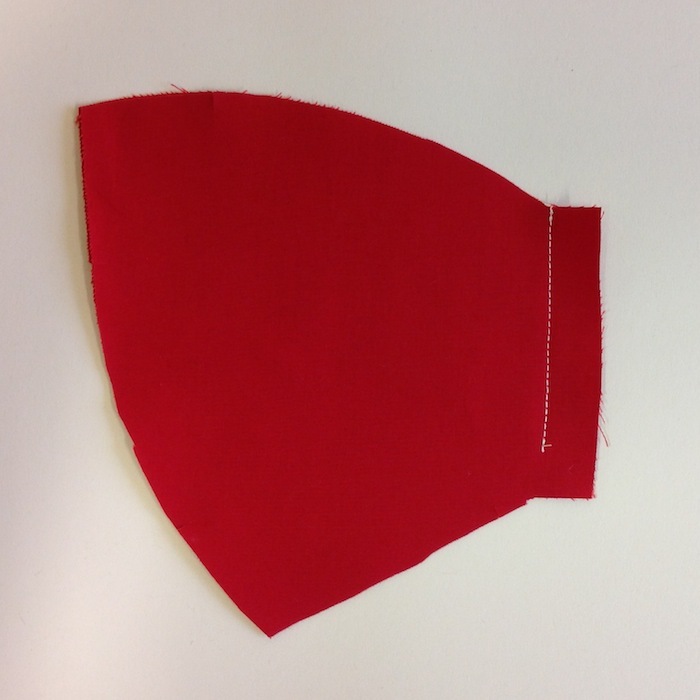 Stitch into place all along the neckline with the usual 5/8" or 15mm seam allowance, pivoting at the centre front seam to get a crispy sweetheart shape. Looking pretty damn hot already, no?